Wishing you all the best this holiday. Please support this! The Pen and Muse and myself as an author are donating goods. Please visit the post here. Joshua is the 21-year old son of author, Maxwell Cynn. Max writes speculative fiction, science fiction, and romance. His son has been diagnosed with Acute T-cell Lymphoblastic Leukemia. The cancer has invaded every part of his body: brain; spleen; liver; lymph nodes; and he has a mass in his chest. Joshua has had to suspend his studies while undergoing aggressive chemotherapy and will not be able to graduate this semester. With three-and-a-half years of a 4.0 GPA toward a degree in philosophy, his peers and professors consider him brilliant, as of course, does his father. Joshua would have been the first person in Max’s family to graduate college. To learn more about this amazing young man, read Max’s incredible post. 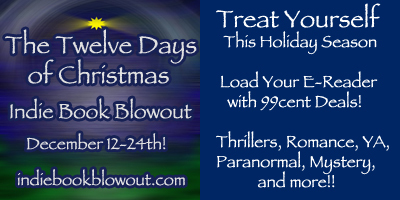 The Twelve Days of Christmas Indie Book Blowout Dec 12-24th! Be sure to check me out on the IBC Indie Book Blowout coming on December 12th – 24th! Help support great authors and their books this holiday season! My short story, Consoling Angel will be featured as part of the YA category. Be sure to go to Indiebookblowout.com for further details!